NYC, 05/30/2019, 2:00PM. 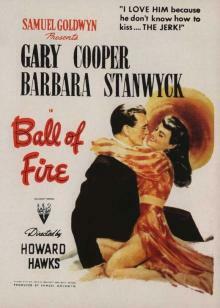 Ball of Fire (1941): Four Time Oscar Nominated Romantic Comedy. A group of professors working on a new encyclopedia encounter a mouthy nightclub singer who is wanted by the police to help bring down her mob boss lover. 111 min. Director: Howard Hawks. Starring Gary Cooper, Barbara Stanwyck, Oskar Homolka. Ball of Fire was nominated for four Academy Awards for Best Actress in a Leading Role, Best Music, Scoring of a Dramatic Picture, Best Sound, Recording and Best Story. In 2016, the film was deemed "culturally, historically, or aesthetically significant" by the United States Library of Congress, and selected for preservation in its National Film Registry.